Bonham’s biannual Staffordshire auctions are staged in the hub of Britain’s traditional motorcycle country. From various barns, basket cases and deceased estates, the auctions frequently uncover substantial caches of valuable and rare motorcycles. Comb the lots after the auction and you will invariably find bikes that were sold for far less than one might expect. It is exactly the right place to get yourself an amazing mount. During the month of October 2015, afterward, the Bonhams Autumn Staffordshire event witnessed the sale of two of the most expensive basket case bikes in history when two Brough Superior 981cc SS100 Alpine Grand Sport motorbikes went for 259,100 (USD $400,000) and £236,700 (USD $365,000) respectively. Another notable bike during this year’s Bonhams Spring Staffordshire sale was sold for the kind of money that has, in recent times, become associated with skillfully restored rare objects of art. This Vincent White Shadow was purchased in 1973 and the buyer got married afterward. But as it often happens, the fabled Vincent 1000cc v-twin superbike bike was discarded by the couple and was ridden for the next two years by the groom’s father, a veteran motorbike enthusiast. To put the importance of the Vincent White and Black Shadows into perspective, they were the '40s equivalent of today’s Bugatti Veyron (the fastest car on European roads until the emergence of the Jaguar XK120).After the father of the groom passed on in 1975, the rare motorbike was kept in storage, where it was not touched again until the present day. It is believed that there are just 16 Vincent White Shadows in existence. This means they are the rarest version of the second most sought-after collectible motorbike make after the Brough Superior. Only very few White Shadows have ever appeared in auctions. The ones that do have made waves and the past few years have witnessed a big storm. In 2015, there was a white shadow that was sold for $224,250, a new record for the marque. But the same bike was already the holder of the record after it had fetched $111,150 at the Quail Motorcycle Gathering held in May 2009 where it had been put on sale by Bonhams. Its value had doubled in six years, even though it had by then undergone a complete restoration. Another unheralded White Shadow was put on auction in January 2016 and its price shot up through the roof. The bike, in bits that were in several boxes, was bought for £1,200 at a jumble sale unicorn. 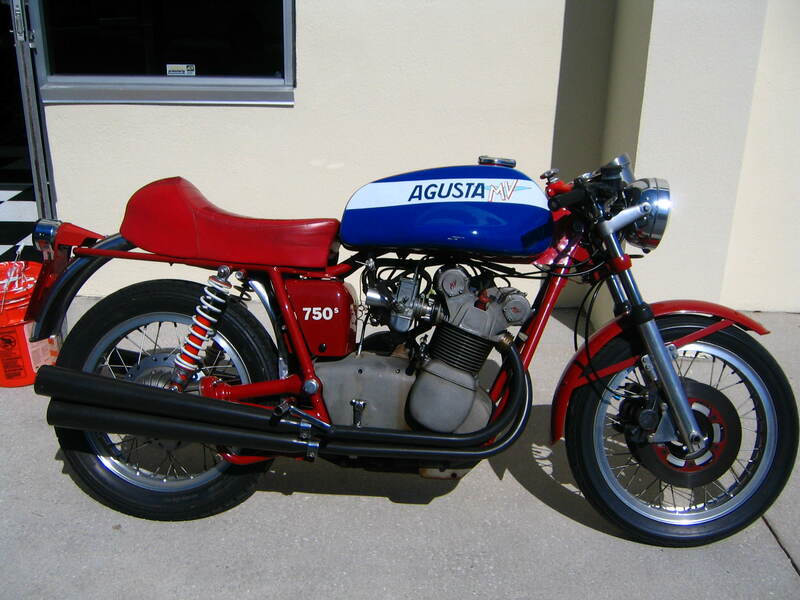 Aware that it was some type of a Vincent v-twin, the buyer’s intention was to restore it. In the course of the restoration, it was discovered that it was a Vincent White Shadow. Even better, after scouring through the records, it was found that it was the only red White Shadow that was ever made. It fetched $434,000 in an auction held on January 2016. It was, therefore, obvious that the White Shadow that was this week auctioned at Bonhams Spring Staffordshire sale would join the list of the top 100 motorbikes of all time in spite of its condition. Indeed it was sold at £163,900 (equivalent to USD $210,045) whereas its pre-sale estimate ranged from £50,000 to £60,000. Now aged 40 years, the MV Agusta 750 is a entering a vintage that will let these limited-edition beautifully crafted bikes to be fully recognized as one of the rarest and most functional collectible machines ever made. This specific motorbike had only three previous owners and it fetched £57,500 (USD $73,689). Interestingly, it had been signed by four motorbike legends that are closely associated with the MV Agusta make Phil Read, John Surtees, Arturo Magni and Giacomo Agostini. Unfortunately, the bike has only traveled 13,267 miles (21,352 kilometers) in 41 years. This motorcycle won the inaugural World 350cc Motorcycle Racing Championship held in 1949.In 1948 and 1949, it also won the Isle of Man Junior TT-the most important 350 cc motorbike race across the globe. The 1949 had only five rounds and Freddie Frith, 40 years old by then, retired when the season ended after starting and winning five races. All other classes in the championships had various winners. King George VI would, later that year, award Frith an OBE for services provided to British motorcycle racing and for generally boosting British prestige. Even though it was based on the Velocette KTT racer and was powered by the DOHC single cylinder engine, it was evidently quicker than its competitors in 1949-outrunning a succession of KTT Velocettes, AJS, and Nortons in each race. The bike fetched the amazingly fair price, bearing in mind its place in history, of £135,900 (US$174,163). Since Frith had already won the title prior to the final round, this is really the first motorbike to win a world championship. After Mike Hailwood retired early from motorbike racing and shifted to car racing in late 1967, a lot of people were of the opinion that he was the best motorbike racer of all time. He had won various world championships in various classes on various marques: -four 500cc titles (1962-1965), two 350cc titles (1966 and 1967) and three 250cc titles (1961, 1966 and 1967). In the beginning, Hailwood competed in Formula One while still racing motorbikes at the top level. In his F1 car racing career, he drove for Surtees, Lotus McLaren, and Lola. His best results were second place in the ’72 Italian grand prix and third place in the ’74 South African GP. In the Le Mans 24 Hours rally, he achieved third place in 1969. However, his most celebrated feat in car racing was his dramatic rescue of fellow racer Clay Regazzoni from a burning car during the ’73 South African Grand Prix. His driving suit started burning as he was trying to remove Regazzoni from the car. However, after he was extinguished by a firefighter, he went back to assist in the rescue of Regazzoni. His brave act earned him the George medal, the second highest award that can be given to a British civilian. In spite of the fact that he was already a legendary figure, Hailwood’s brilliant motorcycle racing comeback was his greatest and most acclaimed feat. As an aging 38-year-old, he went back to topflight motorbike racing a whole 11 years after retiring. In 1978, he won the Isle of Man TT while riding on a Ducati NCR 900, becoming a role model of the baby boomers. Man caves throughout the world were decorated with Hailwood’s Ducati victory poster. A big reason for his successful comeback was his considerably gentle approach, which started when he was requested to participate in a couple of Australian classic bike events. He raced in the events, and this reignited his passion for racing. He also befriended Jim Scaysbrook, who beat him in a few of the comeback races. The two friends rode a Ducati 900 in several Avon-tires-sponsored events and he wore these leathers in many of his comeback races in Australia. They went for £7,250 (USD $9,360), which represents a solid long-term investment. After all, there will never be another 'Mike The Bike'. The Brough Superior make continued to do well generally, with three motorcycles featuring in the top ten at Staffordshire. A 1926 SS80/100 981cc that was projected to go for between £75,000 and £95,000 was sold for £126,940 (USD $163,940), a 1930 OHV 680 Black Alpine that was estimated at between £100,000 and £140,000 fetched £112,380 (USD $145,140) and the 1929 OHV 680 that was projected to sell for between £45,000 and £55,000 achieved £68,700 (USD $118,560).